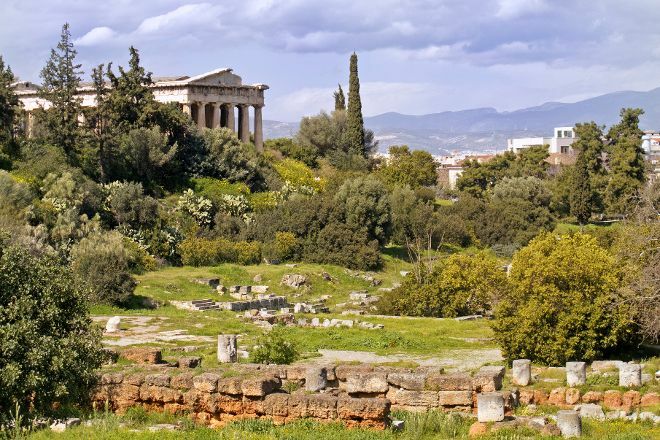 Little changed in the two millennia since its completion, making Temple of Hephaestus recognizable to many on the northwestern corner of Athens' centrally located ancient agora. Dedicated to Hephaestus, the god of blacksmiths, the Doric temple once stood in the middle of a busy area housing foundries and metalwork shops. Built around 450 BCE of marble carried here from a nearby mountain, the temple features 34 columns and an Ionic frieze portraying the mythical twelve labors of Heracles (Hercules). Christians converted the temple into a church in the 7th century and held services inside until 1833. To gain a better understanding of the ancient world's everyday life, take a guided tour of the temple and the surrounding archeological site. Before you visit Athens, use our trip planner to discover what you can do and see there. It is one of the best preserved buildings of the era that I saw. I could not stop looking at it, it's beautiful! Just thinking about 1500 years ago, that was already there... I loved it! Through history, he was well maintained, due to have been converted to a Christian Church (St. George) in the 7th century. During the Ottoman Empire, was the main Orthodox Church. Don't skip this place! It is a very well maintained temple from the old Greek times. Most of the original structure is still standing and gives a good representation of what temples and structures looked like. It is Amazon to stand near it and just think about how long that building has been standing. One of the most beautiful and well maintained ancient Greek temples at the lively historical centre of Athens city. Good photo opportunities from the areas around the temple. Picturesque scenery, it has also pretty nice lighting during the evening hours.